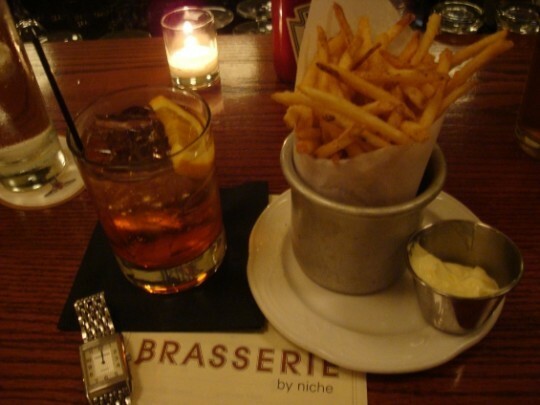 Champagne and pommes frites at Brasserie: a meal we'll surely be nostalgic about in 2020. Most Woody Allen fans, it's safe to say, are incurable nostalgists. Even in the '70s, an Allen film was an escape to another time -- his characters were modern New Yorkers with their "analysts" and adultery, yes, but the details were old school. Diane Keaton's would-be singer in Annie Hall isn't demanding R-E-S-P-E-C-T; she's singing a cabaret tune called, naturally enough, "It Seems Like Old Times." And what's the most memorable part of Allen's masterpiece, Manhattan, if not the glorious black-and-white opening sequence set to "Rhapsody in Blue" -- which George Gershwin wrote in 1924? These days, as Allen's gotten older, his films are downright dated. In a Woody Allen film, no one ever taps away on a cell phone, downloads an iTune or finds a hookup on Match.com. It may be 2011, but his characters place ads in the "personals." So it is with Midnight in Paris, Allen's latest, which deals head-on with the lure of nostalgia. Although at least in this case, his characters have an excuse for not being tethered to their Blackberries. They're Americans visiting Paris; who wants to incur roaming charges? But though the film concludes that nostalgia can be dangerous -- a "denial of the painful present," as one pedantic-yet-correct character concludes -- it does so even while drenching the audience in the worst sort of longing for the past: There's the charming F. Scott Fitzgerald and his lovely wife Zelda! There's Hemingway! There's Djuna Barnes, dancing the Charleston! No matter. Although it would be lovely to see Allen take on the specific absorption of Americans circa 2011, societal critiques are no longer the reason we come to his movies, if they ever were. We come to hear the wonderful jazz, to sink into the familiar white-on-black title credits, to hear the affirmation that, even though life is miserable, it can be redeemed by Cezanne's wonderful apples and Groucho Marx and Mariel Hemingway's teenaged face. By now, we're not just indulging in nostalgia for another time -- we're indulging in nostalgia for previous Allen films. So what better meal to couple with this charming souffle of a flick than a late-night supper of Champagne and crispy frites, at a brasserie that's both of the moment and also wonderfully evocative of another time? Sitting in the cozy bar of the Central West End's Brasserie by Niche (4580 Laclede Avenue; 314-454-0600), it might be 1930 or it might be 2011. It might even be the set of a Woody Allen movie, where smart New Yorkers gather to drink wine and talk about art. It doesn't matter -- it's all good, especially the food. In honor of the film, we chose for our drink the Parisian, a lovely blend of Aperol, lillet and (of course) Champagne that went straight to our head and made us feel almost giddy. Ah, Paris! Or, perhaps -- ah, St. Louis! If nostalgia is "denial of a painful present," well, we don't need to go to Paris for that. We can engage in denial just as well right here in the Midwest. That's what the movies are for, and brasseries, for that matter. Now pour us another Parisian, s'il vous plait!